Sheena Mi is a writer who specializes in topics of beauty, nutrition, health and fitness. She is a certified personal fitness trainer and has a Bachelor of Science in social and criminal justice. She is also a jewelry designer. With so many treadmills available today, many consumers are faced with confusion when determining which are the most affordable and reliable. At the time of publication, treadmills can cost as much as $5,000, a value that may be too expensive for nonathletic runners. A few treadmills on the market are affordable and feature many of the same workout features as pricier models. Look at a few key factors when deciding whether a particular model is worth buying. Find a treadmill with a roomy deck size, approximately 55 inches long and 20 inches wide. The treadmill should also have a cardiovascular and fat-burn program, sturdy frame, strong motor of at least 2.5 horsepower and a clear LED display. Also find out whether the treadmill has a warranty, since these devices do require maintenance. If space is an issue for you, look for a treadmill that can fold up. 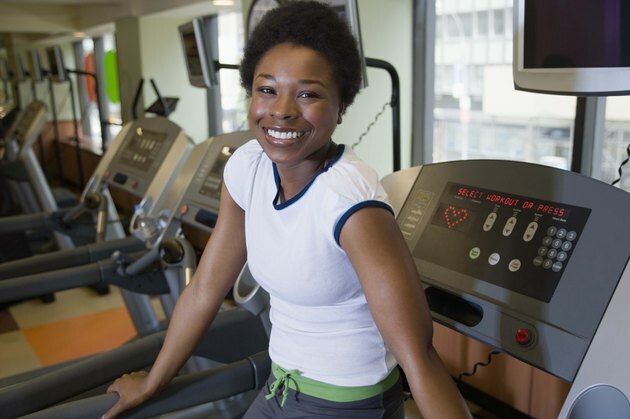 Find a treadmill that is geared toward the level of exercise you plan to perform. Some treadmills have more power than others. If you are a runner looking to buy an affordable treadmill, determine the power of the engine and the speed. The Smooth Fitness 9.35 Treadmill, which costs approximately $1,900 at the time of publication, is an affordable treadmill if you are a serious runner. With a 4.0-horsepower motor and 30 challenging preset programs, this treadmill is a good choice for an experienced athlete. By contrast, the Horizon Fitness T101, which costs $630 at the time of publication, can be an ideal treadmill if you are planning to walk or jog. It has a 2.25-horsepower motor and has a maximum speed of 10 mph. Rated top pick by the TreadmillPros website, the Precor 9.23 costs approximately $1,800 at the time of publication. The Precor 9.23 has a large deck that is approximately 57 inches long and 20 inches wide. This treadmill has a touch heart rate monitor, speed variations of 0.5 to 12 mph, a six-preset run option, 3.0-horsepower motor, lifetime warranty for the frames and welds and five-year warranty for parts. According to the TreadMill Talk website and the Sole Fitness website, Sole Fitness F80 is the overall best value treadmill for 2014. The Sole Fitness F80 Folding Treadmill costs approximately $1,500 at the time of publication. The deck size of this treadmill is approximately 60 inches long and 20 inches wide. Some of the features include six standard programs, two heart rate programs, a 3.5-horsepower motor, a speed range of 0.5 mph to 12 mph, a sturdy frame and a weight capacity of 340 pounds. The Sole Fitness F80 Folding Treadmill also has cushioned deck that is ideal for fast runners who want to have less impact on their joints. It also has a lifetime warranty on its frame, motor and deck, with a five-year warranty on electronics. Fitness: The Complete Guide; Frederick C. Hatfield, Ph.D. Which Stair Climber Machines Work Best?